I read this article and found it very interesting, thought it might be something for you. 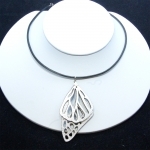 The article is called Silver Two Wing Butterfly Necklace and is located at https://vitoriaglobalfashion.com/product/silver-two-wing-butterfly-necklace/. Leather silver two wing butterfly necklace. Handcrafted by women artisans in Brazil. This product is eye catching and also very light weight.